Stays can be Saturday to Saturday or Monday to Monday during any available week in 2019, except the week of Christmas and New Year’s. Accommodation is for one bedroom with two queen-size beds, one full bath, and step-saving kitchenette. For those who want to totally relax, this package also includes daily maid service. For those who can’t relax without staying connected, enjoy the free Wi-Fi (limited to 1.5 Mbps). What Does the Resort and Nearby Activities Have to Offer? Hacienda del Mar is located along the picturesque beach where the Gulf of Cortez and the Pacific Ocean join forces. This luxurious resort offers five swimming pools (some for kids, some for adults and others for all), fine dining at award-winning restaurants, casual sports bar and grill, poolside and beachside bars, full service spa, and fitness center. Take an evening stroll along the inviting pathways and experience the lush landscape and stunning water fountains. Enjoy golf at either one of the two on resort golf courses including one along the shoreline at the stunning Cabo del Sol championship golf course. Cap it off at the highly acclaimed Cabo Del Sol Club House restaurant -- upscale dining in a casual atmosphere. Transportation is available to nearby grocery stores (including Walmart and Costco), shopping mall, downtown shops and restaurants, lots of night life. Nearby activities available such as Jet Skis, 4 wheelers, horseback riding, zip lines, fishing, parasailing, snorkeling, and much more. American currency and credit cards are accepted for all transactions. Where is Los Cabos (i.e. Cabo San Lucas) Located? 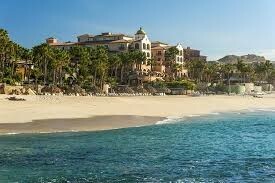 Los Cabos is situated in the Mexican state of Baja California Sur, on the southernmost tip of the Baja California Peninsula; it includes the two towns of Cabo San Lucas and San José del Cabo, connected by the beautiful beaches of the famed “Tourist Corridor”. Characterized by stunning natural beauty, Los Cabos is a dream destination for those who enjoy the Great Outdoors – from swimming, diving, and snorkeling to hiking, zip lining, and golf. Cultural attractions, shopping, and amazing nightlife are all available.